All the forms which I have embedded at www.ipmnet.biz which use captcha have stopped diplaying the Catpcha "word" to type in. I can see that your captcha is working properly on your Website/Page. I have cleared your Form Caches also try to clear your Browser cache and cookies and check back again if you will be able to see the capthca now. However, I can see that your form is cutt-off on the right side. I would suggest to re-embed your form using iframe embed code. This should help fixed this issue. Getting the Form iFrame Code. 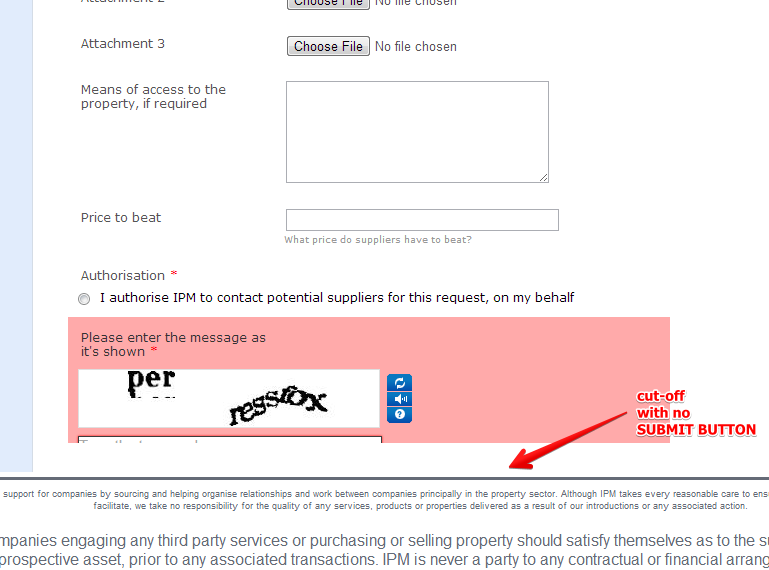 Kindly let us know if problem persists on your captcha, but as I can see you should be able to see it. You just need to use other browser or clear your browser data. Let us know if you need further assistance. Thank you for using JotForm. No difference. Still no Captcha. This is occurring on all machines accessing the website. Worked fine up to yesterday. NO changes from our end. It does not occur when you run the form directly in the browser, only when embedded (using the javascrript option) in a website. 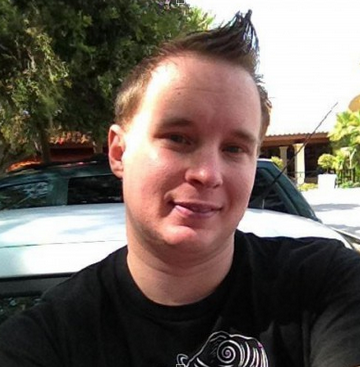 Hi, could you try by using the iframe code instead as @khirsell says? Already tried it – no difference. I can see your captcha is working properly too, from my "Google Chrome Browser", could you try clearing your browser cache and coockies. 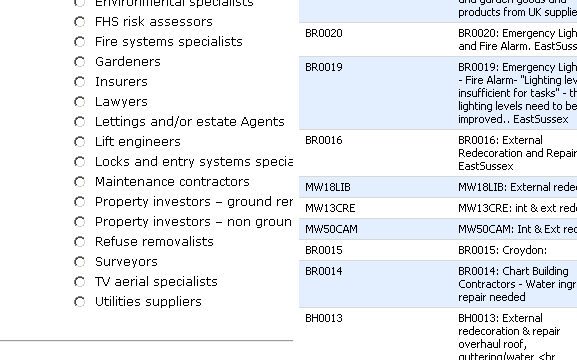 As I mentioned , I have already cleared these down. No change. Using IE10 but it has been fine up to now. Same problem. Busted with Firefox 22, but works with IE8 (dunno about other browsers/versions). No code changes. I checked your captcha but it's working fine from my end. Please implement the Recaptcha function to resolve the issue, however if the issue still persists we would appreciate if you open your own thread to make your questions so that we can give you assistance properly. Yes, I've submitted a separate support request, I'm just confirming that I am having the same issue as Chris so that he doesn't think this is just him. Enabling reCaptcha works (ugly, but works), but Captcha does not. Interestingly, my form says, "Modified August 14" and I haven't done anything to it (until now). Update: Very interesting. My form was showing as "Modified 8/14/2013" and that was not done by me. I went in, changed to reCaptcha (which I hate) and everything worked again. Tested by going back to captcha and it was still broken. So I went back to reCaptcha and saved the form. This time, it said "Modified by YOU..." Hmmm. Waited a couple of hours, came back, changed back to captcha and now it works again. Chris, is yours working again? What OS are you using? 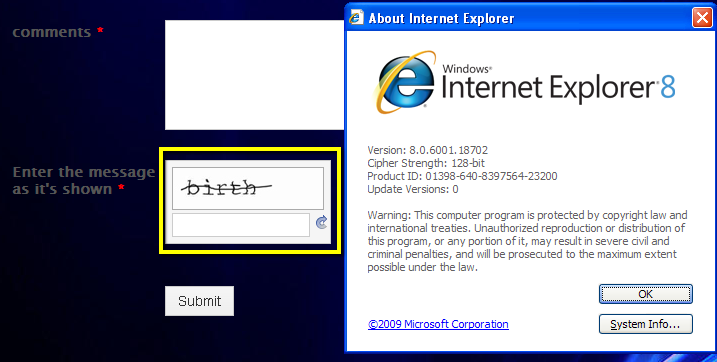 I've viewed your forms in IE10 on Windows 8 and the Captcha is showing as it should be. I would like to suggest trying to Reset your Browser to it's Default Settings to clear your cache and browser of any previous problems that may be leading to this issue. Additionally you may also want to try this in another browser or on another computer to check and make sure that that is not part of the problem. Thank You for the additional info and pointing that out. This may have happened for one of four reasons. Either when we were investigating your forms to try to check for problems with the captcha and someone (not sure who) might've made the change to troubleshoot it but may have forgotten to swap it back. Usually though we only clone your form to check for issues to avoid causing further problems on your forms without your permission otherwise we will ask or if you are reporting the problem is still occurring after we first checked then we will take a look but again we normally do not touch anything without your permission other then to inspect it for further issues if any. Two it may have been a bug or glitch that might've caused this. Three it may have been someone who you gave access to your account that might've been looking into it some. Four it could have been something that maybe you did and forgot about. Either way though, do tell us if your Captcha continues with the same issue. Again, please make sure you embed using iFrame as we suggested to you. Please enable Javascritp and let us know if problem persists after that so that we could further investigate. All appears to be working now, with no changes. We'll watch and see. Thanks for letting us know that the capthca is now working. Please let us know if the issue comes up again. I have NOT let you know that the problem is fixed as it is not! All Javascri[t options are on as suggested. Nothing has change at our end at all. The change can only be at your end. Please note that this is occurring on ALL computers in my office and from home also. I have turned on Recaptcha and it works. I would prefer not to use this as it is harder for the users to use. Can thte normal Captcha be made to work? No, not working Im afraid. Same thing with Recaptcha – it works but I don’t want to use it. I suggest you gather again the iframe code of your form and re-embed. 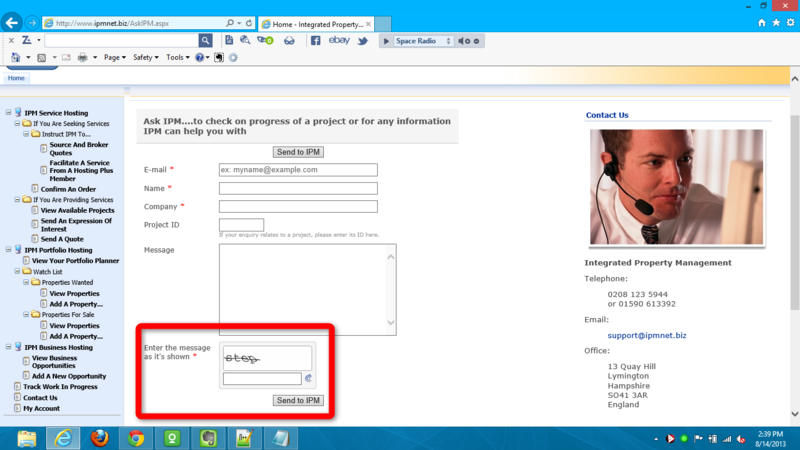 Latest I check in your website http://www.ipmnet.biz/Tenders.aspx , the form is cut-off and the submit button is not visible. This due to the incorrect height of the iframe. If you generate again the iframe code it should fix the height issue. Please inform us if the issue remains. I also tested it in FireFox and it wroked great. Have you already tried using a clone version of your form? If not, please give try, that could help. Let us if you need further assistance. What is the schedule for fixing the Captcha problem which seems to be affecting many users? I'm sorry to hear that this is still giving you issues. We've been looking into this problem with you but it seems that there may be a deeper underlying problem. So here's what I am going to do just to have a second look about this issue on your behalf I will open this via a ticket to have our Developers look into this also but they may tell you the same thing or it might be cancelled if no further issue is found on to be on our end. We will continue to look into the problem to see if there is a solution for this. 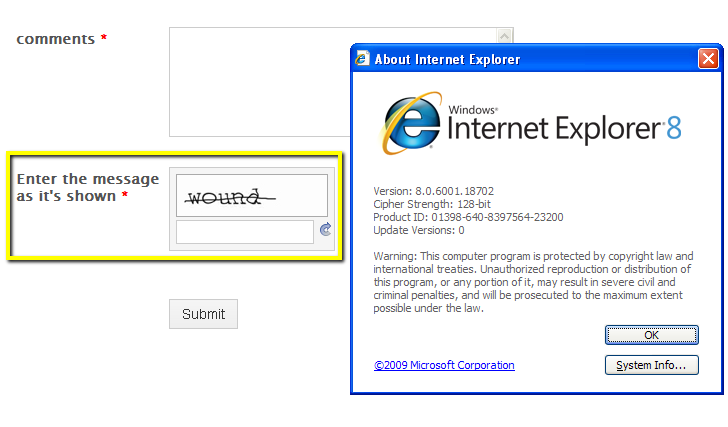 So far during my tests I was only able to replicate the mentioned issues in IE7 but not thereafter. I suggest that as there are so many users apparently with the same issue that cancelling the ticket might be a mistake. Our colleague had already submitted a ticket regarding this issue. Let us wait for updates from our higher team support regarding this matter. You will be notified via this thread and on your email when new updates are available. Did you ever get a solution to this problem? The top area of the Captcha continually shows a spinning graphic indicating its working - IE11 and Firefox 26. Like the others, replacing with reCaptcha works, but its really hard to read. When I preview in JotForm, I can "see" the Captcha perfectly. Seems to be working now in both, IE and Firefox. All I did was repaste the form code. Thank you for your input. If you do need further suppor on this or any other issue. Kindly create a new thread on the forum. Thank you.